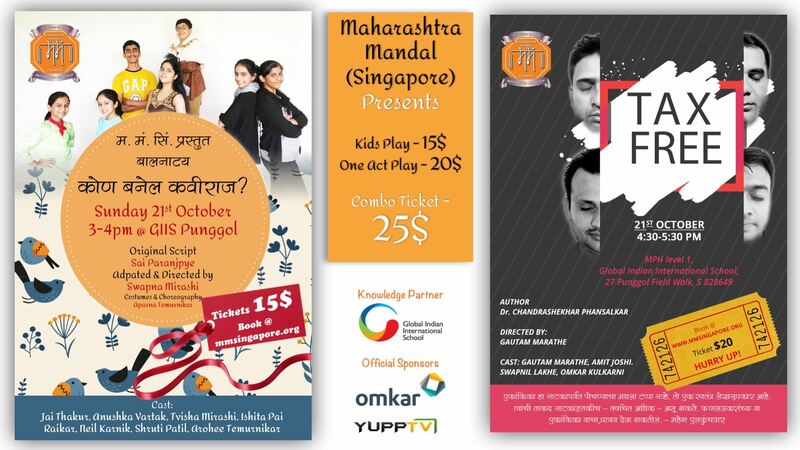 Maharashtra Mandal (Singapore) - MMS Marathi Plays 2018 - म.मं.सिं. बालनाट्य "कोण बनेल कवीराज?" 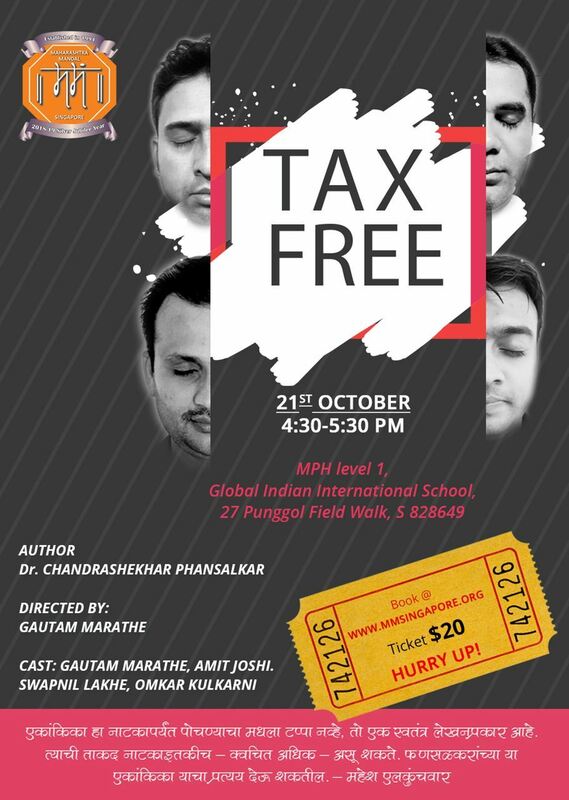 व मराठी दीर्घांक "टॅक्स फ्री"
MMS Marathi Plays 2018 - म.मं.सिं. बालनाट्य "कोण बनेल कवीराज?" व मराठी दीर्घांक "टॅक्स फ्री"
ONLINE TICKET SALE IS CLOSED. TICKETS ARE AVAILABLE & CAN BE PURCHASED USING CASH PAYMENT OR PAYNOW AT VENUE 30 MINUTES BEFORE EACH PLAY. दुपारी ३ ते ४ - बालनाट्य "कोण बनेल कविराज?" संध्याकाळी ४:३० ते ५:३० - दीर्घांक "टॅक्स फ्री"
No Seat selection. FREE SEATING. Tickets required for everyone above 2 years of age. एक सुंदर मोर, एक गबाळा कावळा, एक गोजिरवाणा पोपट, एक हुश्शार घुबड, एक कामसू सुतार, एक कोकिळा आणि त्यांच्यात एक स्पर्धा. सांगा सांगा पटकन सांगा, कोण जिंकेल सांगा? A dazzling peacock, a sloppy crow, a talkative parrot, a wise owl, a workaholic woodpecker, a melodious cuckoo and a competition announced by the queen. Who will win? Who will be crowned the royal poet? 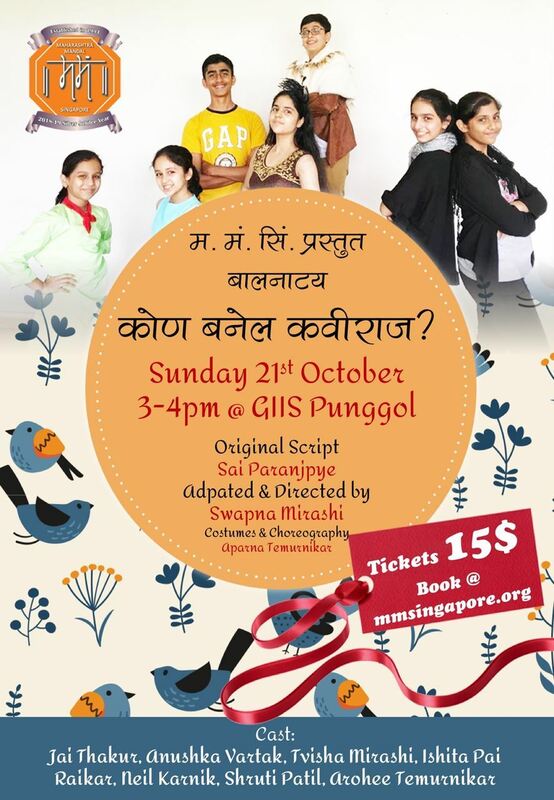 For the young and the young at heart, a live theatre experience with all the razzmatazz, costumes, song and dance and a heart-warming story, impeccably written by Sai Paranjpye and adapted to suit the taste of the discerning young audience of today. A play that whole family will enjoy together and take back in their hearts. मराठी एकांकिकांमधे या एकांकिकेला मानाचं पान आहे. ४ आंधळे एका घरात एकत्र येतात आणि सुरू होतो लपंडाव... विनोद, थट्टा-मस्करी, Shock, surprise, थरार... सर्व काही आहे यात. खरं या अर्थानी टॅक्स फ्री मनोरंजन... नुसतं मनोरंजन की आणखी काही? Don't miss ! Book your tickets today ! !